Donated by Kate Cole, grandniece. William Clark was born at Newcastle on Tyne, England, on the 22nd of April 1894, to Robert Clarke and Elizabeth Davison. William had a brother, Archbold - KIA - and a stepbrother, William Allan, who are also remembered in the Avenue. After Robert Clarke died of TB in 1903, Elizabeth married William John Allan in 1909. Elizabeth's brother, David Davison, had four sons, Alan, Norman, Robert and James, who are also remembered in the Avenue. 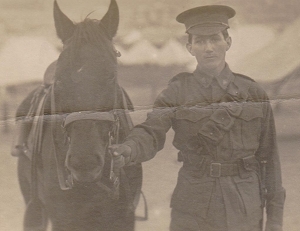 William was a blacksmith, living in Bacchus Marsh, VIC, when he enlisted in the AIF, 4th Light Horse Regiment, on the 19th of August 1914 - immediately war was declared - aged 20. He embarked aboard the HMAT A18 Wiltshire, in October 1914, as a Private. The light horse were considered unsuitable for the initial operations at Gallipoli, but were subsequently deployed without their horses to reinforce the infantry. The 4th Light Horse Regiment landed on 22nd and 24th May and its squadrons were initially scattered to reinforce the infantry battalions already ashore. By the end of October he was promoted to Lance Corporal and in December to Corporal, before being evacuated back to Egypt. In February 196 he was transferred to 1st Division Cyclist Corps, embarking for France a month later. In May William was promoted to Sergeant. July saw him transferred to the 1st ANZAC Corps Cyclist Battalion as a Company Sergeant Major. William had two weeks leave in the UK in September 1918. When he rejoined his unit in France he was under arrest. Conduct to the prejudice of good military discipline in that he allowed [word indecipherable] more men of another unit to remain with his detachment and failed to ascertain why they became attached. A court martial found him not guilty but he received a severe reprimand. He returned to England in December 1918 before embarking for Australia aboard the SS Ulysses in January 1919. His journey home was interrupted when he was admitted to hospital at Gibraltar - Influenza. William re-embarked aboard the HMT Ascanius in February, arriving in Australia in April. He was discharged from the AIF in June 1919. In 1942 William enlisted in the Australian Army, at Foster, VIC. He served in the Volunteer Defence Corps as a Private and was discharged in 1945. He was living in Wangaratta, VIC, in 1967 and died at Beechworth, VIC, in 1972, aged 78. He is listed on the Roll of Honour for Bacchus Marsh, held by the RSL at Bacchus Marsh and the Roll of Honour for the Coimadai State School and also the Holy Trinity Church Roll of Honour held by the Holy Trinity Anglican Church in Bacchus Marsh. He was a Company Sergeant Major.